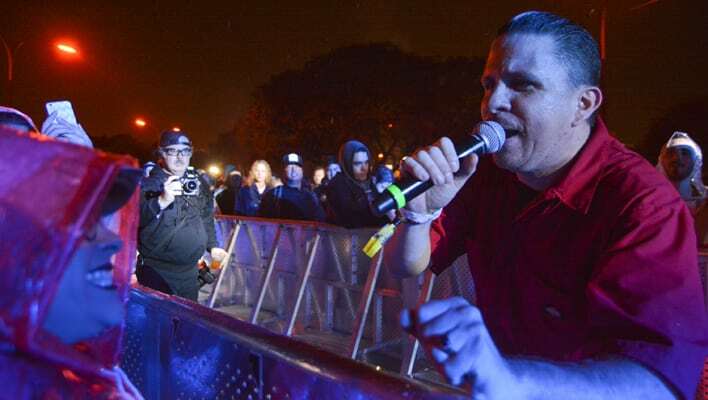 It was quite the adventure getting into the One Love Cali Reggae Fest at the Queen Mary in Long Beach on opening night. It was raining the entire evening, which is pretty special for Southern California, and I’m guessing it wasn’t expected by the promoters – or anybody else. Either way, it didn’t stop attendees from having an experience that had everyone feeling “irie”. Once I made my way through the line at the entrance, I breathed a deep sigh of relief and immediately had the sensation of pure relaxation. Then I realized that along with the deep sigh of relief, there were massive clouds of smoke that also may have helped me relax a bit as I walked past a group of concert goers with dreadlocks. The ganja was flowing freely everywhere I looked. There were two stages at this massive event. There was the main stage, which was labeled the “One Love” stage on the One Love Cali Fest website and there was the second stage labeled the “Queen Mary” stage. The Aggrolites were just starting at the second stage and to my surprise, it wasn’t very crowded. I say that because there were people everywhere else and later I saw that a majority of people were at the main stage. They sure missed out because there was some good dancing at The Aggrolites’ performance. People were singing along and cheering. It was more like a wild party. After that, Fishbone played on the same stage. 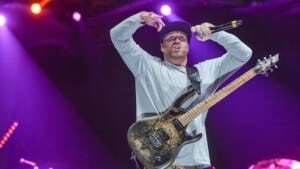 Yeah, Fishbone is playing at this reggae fest and they do have a reggae-esque sound but I kept thinking, “Wait, is this reggae?” Fishbone fans know that they have a unique style and they’ve changed over the years from ska to funk to rock. I guess you could say they do “skunk rock”? Next, I got the munchies. The One Love Cali Reggae Fest was the best place to be for that. I was tempted to get something from the Pink Taco Food Truck or Chronic Tacos but instead went for a plain teriyaki bowl from some place that didn’t have such a creative name. As I headed to the main stage, I came around the corner and saw a sea of people ahead of me. These crazy, fun-loving, hippies did not care one bit about the rain, the mud, or the stinky greenish haze. 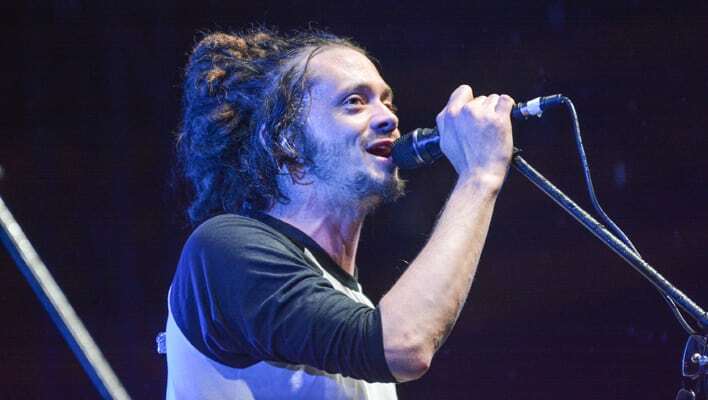 SOJA was playing as I entered the photo pit in front of the main stage. They released their first album, Peace in a Time of War, in 2002 and have four more albums after that so they’ve been around the block a bit. when they thought of the name, but they’re rad and the roar of the crowd as they walked out proves it. Slightly Stoopid offers a fusion of ska, metal, punk, hip-hop and funk. I’m not going to try to name their style like I did with Fishbone – you get the idea. I can tell you that anyone born and raised in California is familiar with this style. At the end of the night, I found myself happy and feeling right at home here on this rainy SoCal evening, right next to the Queen Mary and with all my reggae brothas and sistas!